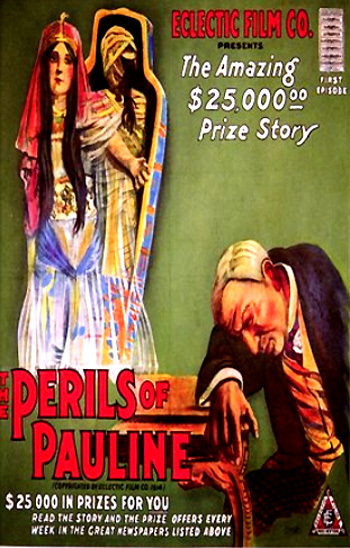 The Perils of Pauline (1914), Pathe's silent film episodic serial, is considered the most famous suspense serial in cinema history. It is not the first serial, however -- that honor goes to Edison's What Happened to Mary? (1913). The Perils of Pauline premiered March 23, 1914 at Loew's Broadway Theatre in New York City. The publicist of Pathe Films (the New Jersey-based branch of the French film company Pathe Freres), P.A. Parsons, set up an arrangement with the Hearst newspapers to simultaneously publish a printed version of Pauline's adventures (or perils). There was a prize contest (with a $25,000 reward) for fans who wished to suggest additional plot points for Pauline's exploits. Pearl White was the most famous star of the silent serials, known for their archetypal cliffhangers that left audiences wondering what would happen in the next chapter. The main theme of each chapter was the heroine-in-jeopardy, although the chapters in this early serial were basically complete in themselves. The daring, athletic and active female star performed some of the riskiest, hair-raising stunts in these films (stranded on the side of a cliff, in a runaway balloon, in a burning house, etc). Every second week in each new installment, Pauline (Pearl White) evaded attempts on her life - she fought pirates, Indians, gypsies, rats, sharks, rolling boulders, and her dastardly guardian. There are numerous reports (some say they are only myths or legends) about her most famous stunt in this serial - in which she was tied to railroad tracks and had to be rescued from a speeding, rapidly-approaching train. Reportedly, the scene was filmed near New Hope, PA at a place now known as "Pauline's Trestle." Unfortunately, a copy of this episode has never been located, and written film plot summaries do not describe the scene. More famously, a year earlier in 1913, Mabel Normand was tied to train tracks and cried out for rescue in the Keystone comedy Barney Oldfield's Race for a Life (1913), and the scene was also enacted in Sennett's Teddy at the Throttle (1917) with Gloria Swanson. Due to this serial's success, Pearl White appeared in an even more successful sequel, The Exploits of Elaine (1914), featuring a mystery villain named the "Clutching Hand," and then in two further sequels: the 10-episode (each 2 reels) The New Exploits of Elaine (1915) (with a new villain named Wu Fang) and the 12-episode (each 2 reels) The Romance of Elaine (1915) (a lost film), battling master criminal Doctor X. The well-known, multi-chaptered, much-celebrated, archetypal play was originally 20 episodes in length (but many have since been lost), and now only exists as nine chapters (rearranged), for a total of 214 minutes.